Theresa May is attempting to "seize power" in the same way that Adolf Hitler did, the editor of Vanity Fair has claimed in a bold editorial, writing the British prime minister's recent actions are accompanied by a "chilling historical echo." In the opinion piece titled 'Theresa May takes her darkest, most desperate turn yet,' the magazine's British editor, Henry Porter, addresses the EU (Withdrawal) Bill, also referred to as the Repeal Bill, which passed its second reading in the House of Commons on Monday. 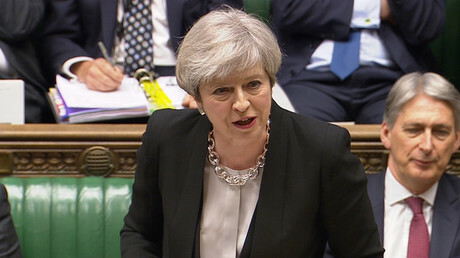 Although May called the passage a "historic decision to back the will of the British people" referring to the Brexit vote, others have taken issue with the so-called 'Henry VIII' powers in the bill, which give ministers the authority to amend laws without the usual parliamentary scrutiny. In short, the Henry VIII powers would allow ministers to copy EU law into the UK's post-Brexit domestic statute book while avoiding any pushback or parliamentary red tape. 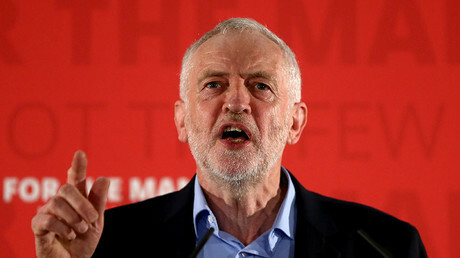 Porter is among those who believe the bill grants May and her fellow Conservatives too much power – so much so that he has likened the prime minister to Hitler. "These powers are named after Henry VIII, England’s most authoritarian monarch, but they in fact bear a greater resemblance to Hitler’s Enabling Act of 1933, which allowed the Fuhrer to bypass the Reichstag and govern by proclamation," Porter wrote in his editorial. "Allusions to Nazi Germany are generally overwrought, but this is no exaggeration: Prime Minister Theresa May does not have an absolute majority in the British Parliament, just as Hitler didn’t in the Reichstag in 1933, which is why she has been forced to resort to his strategy." Porter noted that if the bill is passed in its current state, May "will be able to make laws by decree and reverse and adapt primary legislation without consulting Parliament. It is the greatest attack on the British constitution in at least a century." He then goes on to note another similarity between the Henry VIII powers and Hitler's enabling act. "Parliamentary sovereignty – the very thing that Brexiteers said they were voting for in leaving the EU – may be about to be vastly reduced by a cabal of right-wing Conservatives who say they are obeying the people’s will. Such power grabs, of course, are always done in the name of the people. The full title of the 1933 Enabling Act was 'The law to remedy the distress of the people and the state.'" Porter said the "derangement" of May's minority government is "something to behold, and it is also more than a little frightening." He added that such a blatant move to strip elected representatives of their powers hasn't occurred "even in the America of Donald Trump." The Vanity Fair editor went on to accuse MPs of being "so caught up in the madness of Brexit that, for the most part, they cannot see the power grab for what it is." He also criticized media outlets, including the BBC, for having "so little concern" about the issue. Others have also compared May to Hitler following the House of Commons passage, with many taking to social media to express their opinions. "Theresa May has become, in the last two days at Westminster, a tinpot Dictator like Hitler, numerous rulers in Africa & S America & Asia," one person wrote. Theresa May has become, in the last two days at Westminster, a tinpot Dictator like Hitler, numerous rulers in Africa & S America & Asia. — Hon Bugger le Panda (@BuggerLePanda) 13 сентября 2017 г. Another tweeted to the prime minister, asking how it feels to be "walking in Hitler's footsteps." — Ros Petherick (@PetherickRos) 13 сентября 2017 г. One person asked May if she ever imagined she'd "copy Hitler's methods" so she could "get her own way." Dear @theresa_may. When you started in politics, did you ever imagine you'd copy Hitler's methods, so you could get your own way? — 🇪🇺WriterInPyjamas (@WriterInPyjamas) 12 сентября 2017 г. Another encouraged Brits to contact their local MPs in order to "stop Theresa May's version of Hitler's Enabling Act." — Tiernan Douieb (@TiernanDouieb) 11 сентября 2017 г.
MPs have tabled 59 pages of amendments to the bill, including one preventing ministers from using the Henry VIII powers to alter workplace protections, fundamental rights, equality provisions, or health and safety regulations. The amendments will be debated when the bill returns to the Commons next month for eight days of scrutiny.